Good evening. Cody’s Dad filling in for Cody who is a bit pouty (No I’m NOT!) since the arrival of the Magic-man. 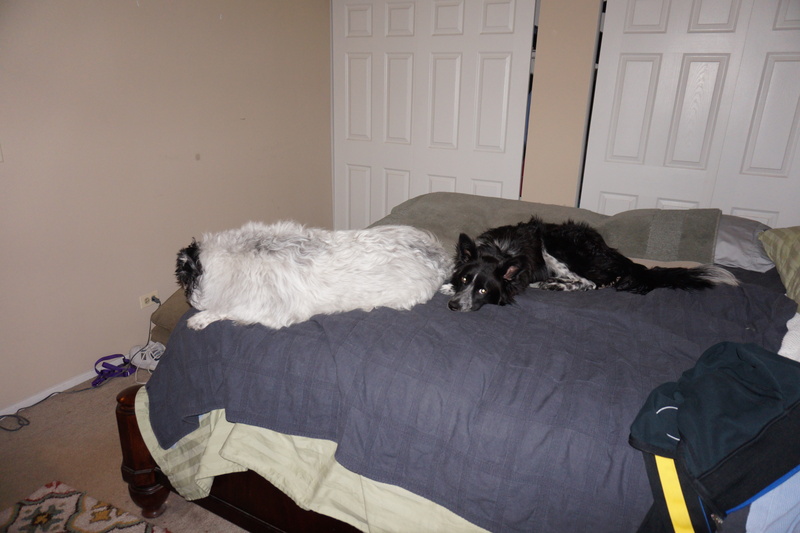 For the most part, the two Border collies are in their own orbits, doing their own thing. But when Magic starts squeaking toys and throwing toys about the living room, Cody will always emerge and confront me…”play with me, throw some toys for me, I want a squeaky toy.” And Cody has “corrected” Magic five times; usually with subtle showing of the teeth and Magic responds immediately. Yesterday morning, there was a showing of the teeth and a “move” towards Magic which resulted in a yelp and an immediate retreat – no damage except to Magic’s psyche. Magic’s comfort level and his realization of where he fits into the daily routine has been moving very quickly. He is a very smart boy who watches everything. He prefers sleeping with Cody and me in the king-size bed, he is VERY good at “let’s go out” signals, and he is acclimating to trips in the car. He learned “shake” in 12 tries. He LOVES greeting people, he is very affectionate and loves to put his nose very close to your face and ears…the whiskers cause some tickling. Last night, Magic was trying to decide where to sleep – the love seat in the living room or in the king-size bed with me and Cody. He initially chose the love seat but started alert-barking. He has a deep, gravelly, very intimidating bark, and can also come in with a very menacing growl. However this bark and growl combination is so in contrast with his happy-go-lucky and endearing personality – THIS BOY LOVES EVERYONE. I cajoled him into the bedroom, closed the door, and he immediately jumped up into MY part of the bed. He tolerated getting pushed over to HIS sleeping area and then it was lights out until 600am. Magic has been sleeping through the night. Still no accidents and at this point I believe we are not going to see any, he has been VERY steady. Two BC’s on the king-size bed. Just don’t get in Cody’s grill. When he does want to go out, he walks to the entry-exit door and presses his head into the door…….and just stands there while looking back for me. While we started out with leash and collar walking, Magic was lunging, especially at passing cars. His wonderful foster-Mom, Kathy, from Great Lakes Border Collie Rescue, suggested that I use a harness. I had a purple harness from Cody’s younger days. Wow, what an amazing change of pace. Magic immediately stopped his lunging and he is much easier to control (and train) regarding his fascination with moving cars. 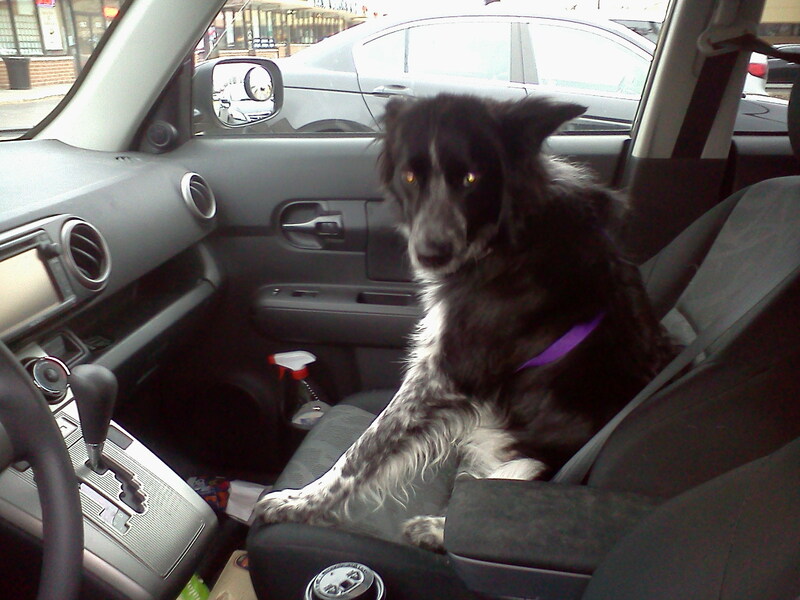 And while we are on the subject of cars, Magic appears to be adjusting to going bye-bye in the Scion. He is now jumping into the front passenger seat with no hesitation. He will NOT jump into the back or have anything to do with the back…too close to Cody? “Bye-bye in the Scion. I am very quiet and don’t pay much attention to cars when I am IN the car. During our second walk this morning, Magic suddenly slowed his pace and let out a growling bark, alerting me to a lone male to our right. Good job, Magic! 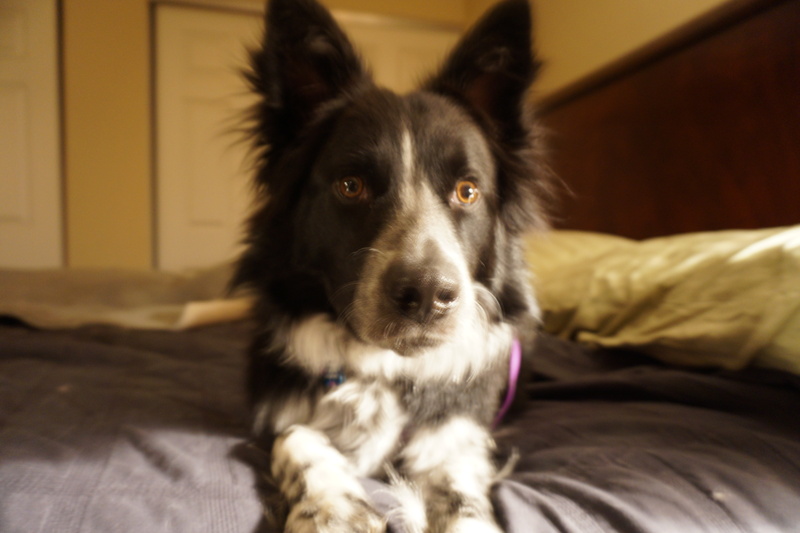 This entry was tagged border collie, border collie rescue, dog rescue, dogs and people, herding dogs, life with dogs. Bookmark the permalink. Yep – you are cute! Love love that purple harness. It’s my turn….no, it’s MY BLOG…c’mon, let me say something….go play with your squeaky duck toy. Hi Lincoln, this is Cody….and Magic says HI!